"Molelo, the Fire Elephant delights and engages young readers with an entertaining mix of warmth, humor and meaningful subject matter. The tale opens with baby elephant Leo living happily among the herd, where he eats, sleeps and frolics under the care of a loving mother and the companionship of his good friend, Masego the Oxpecker! Despite a warning to remain vigilant to the possibility of fires set by poachers, Leo soon finds himself alone amidst a dangerous, fiery landscape. He survives largely due to the help of human rescuers who remove him to the safety of an elephant sanctuary. There, Leo is given a new name (Molelo, meaning "from the fire"), grieves the death of his mother, and makes new friends, both human and elephant. The illustrations are lovely, the writing pitch perfect. Together, they deliver an enjoyable adventure that doesn't shy away from emotional ups and downs. Molelo, the Fire Elephant is based on a true story and is part of Green Kids Club's new series of Baby Animal Environmental Heroes. 50% of proceeds will go to Elephants Without Borders." "Children find this story about a brave baby elephant's trek and the ever-expanding group of young animals that join her along the way to be utterly captivating. When Baby Elee wakes one day to find all the other elephants gone, she recalls her mother saying that following the shining star for seven days and seven nights would lead to a waterhole that never goes dry. Accompanied by new friend Kubu the baby hippo, Elee sets out for the waterhole, traveling at night when the stars shine bright. The two soon encounter Kibwana the lion cub and subsequently are joined by a new baby animal with each passing day. Young readers readily identify with the angst of separation from family, the joy and comfort of acquiring new friends, and the confidence and competence that comes with achieving greater independence. The story is endearingly and expressively told using language perfectly suited to the targeted age group and artwork that charmingly conveys the baby animals' personalities and emotions. Written by Sylvia M. Medina. Illustrated by Morgan Spicer." Elee is an adorable baby elephant living on the African plains with her mother. The dry season is causing the slow disappearance of the watering hole, which is crucial to the survival of the plains animals. But Elee's mother assures her that if she follows the giant, bright star in the sky for seven days and seven nights, she'll get to the watering hole that never dries up. This sparks a long journey for baby Elee. And along the way she'll meet a variety of African animals, such as a lion, a hippo, a zebra, and more. Will they reach the watering hole before it's too late? You'll have to read Elee and the Shining Star to find out! Sylvia M. Medina has done an absolutely fantastic job with this picture book. We don't learn much about individual animals, but we do learn a lot about the importance of watering holes and how a drought can affect the wildlife. It also has elements of friendship, family, bravery, and believing in an idea to the point where you take risks. But where Elee and the Shining Star really shines (pun intended) is in the artwork. Illustrator Morgan Spicer has true talent. The purple and blue hues of the book are enchanting and calming. Elee's eyes are filled with emotion and personality. And there is movement and action in these images. Even if you are not entranced by the story itself, it's still worth picking up this picture book just to enjoy the illustrations. I myself would love an Elee print for my wall, if I am honest. I think this author and illustrator duo make an incredible team and I'll be first in line for whatever book they come out with next! To participate in Multicultural Children's Book Day, our family recently received The Elephant and the King from Green Kids Club, written by Sylvia M. Medina and illustrated by Joy Eagle. The dynamic duo have written and illustrated many books for Green Kids Club. We have never read any books by Green Kids Club before, but we are glad we discovered them. The Elephant and the King features young Green Kid members Maya, Victor, and Maatia. Green Kid members possess the ability to talk with animals because they drank water from a magic spring. The story follows Maya and Victor who are visiting Botswana, Africa and the local Maatia shows the two around. Maya wanted to see elephants during her visit, but Maatia warned her that it might not be possible to see them due to the poachers. The three encounter a baby elephant searching for her mother who has been captured by poachers. Maatia drinks the magic spring water and becomes a Green Kid just like Maya and Victor. The three members, along with the help of other animals, help save the mother elephant from poachers. I wasn't sure about the book at first. I usually pre-screen books before I read them to my children. I have a highly sensitive child so I wasn't sure if the book would upset her if she found out people kill elephants for their tusks. We read it, and both my children loved the book. They asked if there were other Green Kids Club books, and I told them there were so it looks like we will be buying some. The book was written in a very gentle way about the illegal poaching of elephants. My children learned some interesting things about elephants, and they were particularly amused by the fact that elephants help fertilize plants by excreting seeds that they have eaten in fertilized dung piles. After reading the book, my youngest grabbed the book and drew a picture of an elephant and labeled the parts of the elephant she knew. I love a book when it teaches my children something new. "This book is dedicated to those who are helping to reduce the plight of sharks, due to shark finning and to their capture(both intentional and unintentional)." A fantasy picture book with a narrative geared to readers aged 5-9, The Shark and the Volcano is one of a series of adventures in which the "Green Kids" obtain super powers that permit them to confront and resolve environmental issues. The Green Kids are introduced to a young shark by a friendly dolphin. At first fearful, the children listen to the story that the shark tells via the powers of a magic spring that permits people to understand the languages of the marine animals. The young creature tells them that his father is at risk of having his fins removed by men, as have many other sharks. Several marine animals, as well as the children, spring into action to convince the fishermen to stop the practice. The beautiful spectacle of a girl coming to them across the water on the back of a dolphin and the young people's reasonable arguments convince the adults. The book ends with some basic facts about the lives and habits of sharks. The beautiful illustrations by Joy Eagle, the fantasy elements, and the aspects of family life, as well as the timeliness of the subjects of endangered species of marine life, make this children's story engaging as well as informative. Through acknowledgements of fear as examples—the children's initial fear of sharks, as well as the young shark's fear for his father's safety—child readers are able to acknowledge their own unease in situations of daily life. The Green Kids Club Adventures illustrate the positive forces of friendship and education in ways that children can find enlightening and empowering. Toys, Tots, Pets, and More! Green Kids Club set comes with a sleeping bag, pillow, play tent, Wolf Howls book, and Tiago and wolf suit. The Green Kids Club book, Wolf Howls featuring Tiago, by Sylvia Medina, is a story about the Green Kids, Victor, Maya, and their little brother Tiago, who travel to the Rocky Mountains to camp with their friend Kaya and have a wolf adventure. Based on the book, the Tiago plush doll comes with a removable Velcro wolf suit. Tiago has on a shirt and pair of shorts underneath. The Velcro sleeping bag has a plush pillow attached, and the play tent, which measures 12x12x10 inches takes a couple minutes to assemble, has a tie-up opening and Velcro closures. The tent can comfortably fit up to two Green Kids plush figures. Ages 3 and up. The Green Kids Club products are all about animal and wilderness awareness. This is a great way to get kids engaged with such issues. Kids will love reading about Green Kids’ adventures and recreating scenes from the book with the Tiago plush doll and camping accessories. Recommended for kids, ages 3 and up, who love learning about the outdoors and animals. Each Green Kids Club product is sold separately on www.greenkidsclub.com. "The children's book is a delightful story embracing the splendor and abundance of Africa's wildlife, sending a pertinent message that wildlife and people can co-exist and live in harmony, yet also delicately brings light to a critical issue regarding the plight of wild elephants." Jade Elephant is written by Sylvia M Medina & Saige J Ballock-Dixon and illustrations are by Joy Eagle. This is a book in green kids club series that is dedicated to the children of India and all the Green Kids of the world. This is the second edition that I have in my hands. Jade Elephant by Sylvia M Medina & Saige J Ballock-Dixon features a new character in this story whose name is Anju and she lives in India. Maya and Victor are the regular characters of the series those who have read other books in the series would be familiar with both. Victor and Maya Green are seen currently visiting India to meet their pen friend Anju. Anju is to take them for a ride on her cutely decorated elephant. A ride to the nearby jungle. This would be the first elephant ride for the Green kids. The elephant is decorated with colorful, fancy blankets and shiny ornaments. There are two in fact and both are well decorated. The elder one is the mother elephant, Mudahrima and the younger one is Gajendra, called as Gaj. Climbing on the elephant was itself an adventure for the kids. As the Green kids enter the jungle, they are welcomed by different and strange noises of various animals and birds. The see many birds and animals engaged in various activities. As they are about to reach the area of the jungle that is near the village, they see most of the trees cut in that area. Anju explained that the villagers keep cutting these trees to get more land for cultivating their crops. That is a regular fight mankind is engaged in destroying nature and trying to imbalance the ecosystem. Animals and birds need space to live. But if mankind starts squeezing the space intended for the animals, it generates danger for the survival of those animals and hence disturbs the complete ecosystem built by nature. Jade Elephant by Sylvia M Medina & Saige J Ballock-Dixon tries to convey a message regarding all these issues in the form of this lovely story. Loud trumpeting sounds from one side of the jungle make Green Kids curious to know about it. Anju tells them this noise is coming from the Elephants place where all the elephants of the jungle meet and play together. On Green Kids request, Anju takes them to show the place and all those elephants.There they see Parmita the leader of all elephants. Parmita instructs all the elephants to get ready to destroy the village and villagers for the sake of their own survival. The story gets intense and it becomes very risky for the kids when they get revealed from their hiding place by Parmita and other elephants. Green Kids and Anju request Parmita and all other elephants to give them a chance to educate villagers for stop destruction of the jungle. The story goes interesting and intriguing as we go further. There are quite serious messages hidden in the story for all of us to understand and act accordingly. Jade Elephant by Sylvia M Medina & Saige J Ballock-Dixon is a good and interesting read not only for kids but for elders also to spread the message of stop destroying jungles. Every page of the 30-odd pages carries an interesting, colorful and vibrant illustration carrying a message in itself. 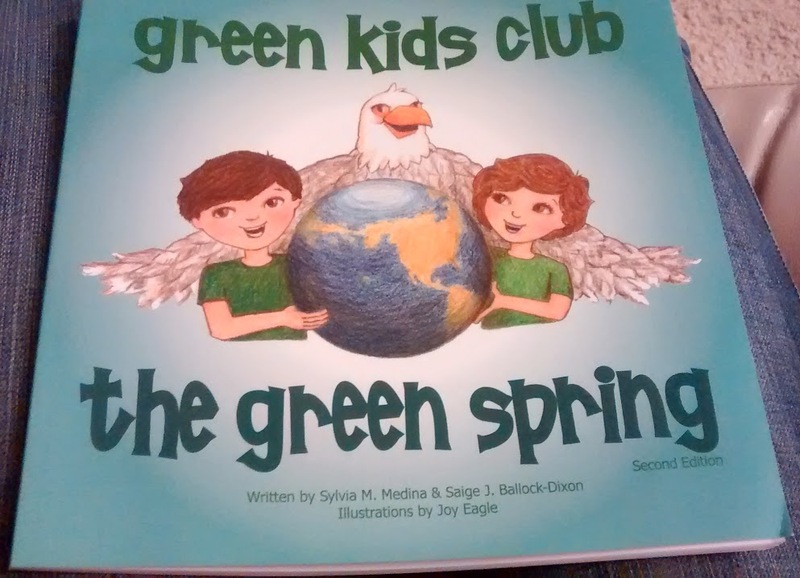 My day job is actually related to sustainability in science and I’m quite passionate about the subject, so I was very intrigued when I heard about this Green Kids Club and had a chance to review one of their books. The club’s tagline is “environmental activities for kids” – with 5 and 7 year old kids at home, that seems perfect for me to get them engaged and excited about the environment around them. Their website has a few activity suggestions and some very simple games (a word search, matching game, and a couple where kids can interact with a simple scene on the screen). These games seem to be made for touchscreen devices, so I would recommend trying them out on a tablet or phone. The book I received is “The Green Spring”. The illustrations are nicely done in a style that I think will appeal to younger kids. The text though is a bit heavy handed with a teaching type style. I wish that it were more plot and character driven, with a bit less obvious attempts to push environmental principles onto the reader. It just feels to me that the kids would be more likely to embrace and retain the key messages if the story were more engaging in this way. With that said, I do think it provides a nice introduction for kids to the basic concepts of environmental sustainability, with a cast of animals and children that young readers can relate to. All in all I’d say this is a cute book for a classroom setting where the messages can be backed up with some interactive group activities, but might not be my first choice for a home library where it’s harder to plan some of those related exercises. I’m very glad that I was able to receive this as a free promotional sample in order to evaluate and provide my honest review. Green Kids Club is educational and engaging for young children! Looking for a way to teach children about maintaining ecosystems and animal life? The Green Kids Club is a great way! It engages children through stories, activities, lessons, video and music. I received a sample of one of the books titled The Green Spring and found it educational and engaging. Children will easily be able to relate to the stories. The Green Kids Club works with animals to improve our world by using basic sustainability concepts of preservation, reduction, prevention and mitigation. Stories are developed to teach children the importance of protecting habitats to maintain ecosystems, animal life and ultimately human life. What Is the Green Kids Club? Green Kids Club is designed to teach young children the importance of environmental stewardship through picture books. The series was developed as a utility to teach children the importance of protecting habitats to sustain ecosystems, animal life and ultimately human life. Difficult environmental issues that impact animals and human interaction are brought into the story lines. Examples include habitat encroachment, poaching, extinction. Victor and Maya Green are the leaders of the Green Kids Club. They received the power to talk to animals by drinking from the magic spring (The Green Spring book). The Grand Council of animals selected Victor and Maya to help preserve and protect their homes. Green Kids from all over the world are selected to help Victor and Maya teach others about the importance of protecting animals and their homes. Their adventures take them all over the world, exploring new cultures and learning about protecting and preserving the environment and the animals that depend on them. Growing up, I cared very much about the world around me. I enjoyed learning about animals, their habitats and even enjoyed heading to the nearest zoo to see some in person. Little did I know that I was oblivious to what was really going on in the world. I never knew people would end up be so cruel as to kill animals let alone even ruin the places that they lived. I’d like to instill in my kids the same love that I had for animals. To just be outdoors and take in all of what nature has to offer. What better way than with a club based around everything animals and protecting what is so rightfully natures and the Earth? For my review, I received a book in the mail called Green Kids Club: The Green Spring. In it you learn about how Victor and Maya get chosen to be the Green Kids and teach others the importance of protecting and conserving our environment. All throughout you’ll find beautiful illustrations of what is going on in the story. As I was reading this to my little one, she kept wanting to see the pictures. It was very well written and beautifully done. They even sent along a little magazine with other products they carry as far as books (and even toys) go. After reading the story, we headed to the Green Kids Club website and did some exploring there. It’s very easy to navigate and you don’t have to pay a single thing to sign up. I signed up my 3 year old for this review. You can find fun things on the website such as games and coloring pages. Be sure to stop by the shop and check out all they have to offer there as well. Also, they offer an app for the Green Kids Club for iOS. I think it’s great that the Green Kids Club exists. Our future depends on preserving what is meant to be here and the animals that have a right to be here. I know all too well just how people are forgetting what matters when it comes to our environment and the animals that live among us. I think if every parent were to tell their kids just how important our environment is, we’d see a great increase of those out there in the field who are dedicated to changing our world and our future. Wolf Howls: Wolf Howls is an adventurous. educational and enjoyable tale about young Tiago and the Green Kids. Through abduction by a lonely and sad wolf, and reunion with his family, Tiago learns about the plight of the gray wolf and the threats the species faces. This is a great book to help inspire children to care for the planet and its wild inhabitants. It can teach young people to consider their surroundings, beyond themselves, and to grow respect for the environment. Parents should add this book to their children's reading collection. Desert Mirage: This Green Kids Club book finds the kids in Arizona learning about water shortage and how it effects wild animals. A family of wild horses teaches the kids about the importance of saving water and the kids agree to help spread the word. Though the subject of drought is not fun, the book is very entertaining because of the friendship developed between the kids and the wild horses. Reading the Green Kids Club books are a wonderful and engaging way for young people to learn more about the planet, its precious resources, and how they can help protect them. Wolf Howls was reviewed by our local newspaper, the Post Register on 12-7-14. Green Kids club is on the list for the 25 Dr.Toys for $25. This is a big step for green kids club! We are always trying to think of ways to help our kids understand the importance of taking care of the environment and living greener lives. I always find that children's books are the best way to convey important messages that we want the boys to learn, because they're captivated and pay attention to books, if they're written well. Imagine how hard it is to teach a 3 and 6 year old about habitat encroachment, poaching, and extinction without pictures and fun stories. I was thrilled to be able to review the Green Kids Club books because they are the perfect way to teach our kids about protecting habitats, ecosystems, and animals. And how important preserving the environment is to humans, too! The Green Kids Club books have captivating pictures and interesting storylines. They are geared for elementary aged children, but D loves to flip through the books and look at the Green kids and all of the animals. The Green Kids are led by Victor and Maya Green, who received the ability to talk to animals by drinking from the magic spring. They also share that ability with other kids so they can have the same power! Different stories focus on different areas on the world which is great for geography lessons, too! In the back of each book, you'll find photographs of animals and important vocabulary from the book. These really are very good educational books. There is even a book in English and Spanish, "Minas Chilenas," which is Spanish for "Chilean Mines." The Green Kids are easy to love because of their fun adventures and animals that they meet! And the Green Kids website goes above and beyond by offering online coloring pages, games, toys, DVDs, and more! These books would be great for any classroom, homeschool family, or just any child that loves animals and loves animals and learning about the environment. And above all, these are great books for green kids! What do you think about the Green Kids Club books? Kids can make a big impact on the environment in a positive way. And to make a big impact, you don’t have to do big things. So here are 7 ways small children can save the world! I’m only becoming more and more of an ecologist. I’m not brainwashing my kids to save the world, but I am teaching them, their actions will affect the environment – in both good and bad ways. And I’m starting conversations with them about their impact. I hope you like these small things… that are actually BIG! 1) Pick up trash at the park or on a walk. I keep a few old plastic grocery bags in our stroller and before we leave the park each child picks up as many pieces of trash as their age. Even just one “trash walk” around the neighborhood a week will help keep your area clean and give your kids a sense of ownership for their neighborhood. Conversation questions: What would the the park be like if no one threw away their trash? Why do you think this person threw their trash on the ground when there is a trash can right next to the playground? 2) Turn off the water while you brush your teeth. I’m sure you have heard this water saving tip a thousand times. So why do you still leave the water on? You’ll waste about 2 gallons of water if you leave the water on while you brush your teeth! That would be enough water to fully hydrate my family of 6 for a whole day. Do this Experiment with your small children: Plug up the sink, brush your teeth with the water on, and watch sink fill up. Then take your cup and dip it into the water and scoop out the amount of water your child will use to rinse out their mouth. Compare the amount of water and ask if they should waste all the water in the sink, when they just need the water in the cup. Practice turning on and off the water together. 3) Visit the Farmer’s Market once a month. It might seem silly, but in this age of prepackaged/pre-prepared everything, so many kids don’t understand where their food comes from. As you walk the isles let your little ones touch the different fruits and veggies (with the vendor’s permission). Pick up ones they are interested in, to talk about the colors, textures, and taste. Let your kids ask the farmers about the food too! Buying your weekly fruits and veggies from the farmers market, even just once a month, will make a big impact on the environment: Supporting local farms, less fossil fuel than grocery store stock, and the knowledge your kids get about food and where it comes from will last a lifetime! 4) Use both sides of the paper when coloring or doing art projects. If your kids are anything like mine, they will create an art masterpiece on one side of the paper without ever being aware of the valuable paper-real-estate on the back. Or after a piece of paper has one line of color, it’s tossed in the trash. Talk with your kids about using the backside of their construction paper for drawing. This would cut paper waste in half… well… kids art paper waste! Here is a great exercise to help them understand a paper with a bit of doodling from a former owner is still usable. Take a piece of paper and make a few simple doodles. i.e. a line or a circle or a scribble. Then guide your child to use their imagination and add to the picture. This is a really fun game. You take turns adding to the picture until the paper is full. Then the next time your child comes across a “used” paper in the paper pile, they be ready to play a fun game, instead of throwing the paper away. 5) Turn off lights in a room. Electricity is generated from fossil fuels, such as coal, natural gas, and oil. If we use less electricity we reduce pollution from all of the above. This is a bigger concept for small children to understand. But they will be able to understand, the lights should be off in a room, if the room is empty, or if it’s light outside. Play a game by turning on all the lights in an area of your home then letting your child race to turn them off. Do this a few times, all the while cheering them on as they try to beat their time. Give your littles the job of turning off all the lights before you leave the house. 6) Use reusable bags. Plastic grocery bags are the worst. WORST. They don’t biodegrade, it takes 12 million barrels of oil to make the Unites States’ plastic bags a year (so it can raise fuel prices), and plastic bags kill like eleven billion animals every year because animals can’t digest the bags they eat. (See this list for so many more reasons too!) Instead opt for good reusable cotton, canvas or denim bags. (I read somewhere polypropylene can leach toxins. Polypropylene bags are that thin bumpy material, used for a lot of the reusable bags… I searched for some more info about that but didn’t find anything conclusive about the bags, but it sill freaks me out.) Let your small children be in charge of packing the reusable bags before a shopping trip! I give my kids a penny every time they remember to pack our reusable bags. They think that is so fun! 7) Recycle and use reusable water bottles! You can just ‘copy and paste’ most of the reasons not to use plastic bags, for not using plastic water bottles as well. Instead, use a good reusable glass or stainless steal bottle (these and these are great!) But if you have to use a plastic bottle, recycle it! I know families that let their kids keep all the recycling money and that really motivates the kids to take ownership of the recycling chores. (Our city has separate cans for the recyclables and that makes it very easy to recycle. We do miss out on a payout from our recyclables, but I also don’t have to store things, or make an extra trip out to the Recycling Plant.) Consider getting a trash can/recycler combo or recycling can ! It’s pretty shocking how many things can actually be recycled! Small children love to guess what things go in the recycling and what things go in the trash. I hope you enjoyed my 7 ways small children can save the world! Just to add to the ecology fun, I’m giving away these adorable Green Kids books. 5 paperback books that share the “going green” lifestyle with kids who can talk to animals. Now that’s something to smile about! The illustrations are bright and beautiful, and each book’s theme is topped off with a related science section in the back. Follow the instruction in the box below to enter! Disclaimer: I am a member of The Social Media Panel, LLC. who was given the opportunity to review this product. However, the brand or company has not influenced me in any way to provide any type of review other than my true and honest opinions. I am disclosing all information provided in this review according to the information provided in Federal Trade Commission’s 16 CFR, Part 255: “Guides Concerning the Use of Endorsements and Testimonials in Advertising. I really appreciate finding good books to read to my children. Sometimes, I find I have to skip over some words that I dont like or explain why I do not like them to my children and that can interfere with the story. So, I am grateful to books like the Green Kids Club books that discuss environmental issues and ways to protect our environment, great topics to discuss with our kids. What is Green Kids Club? "Green Kids Club is designed to teach young children the importance of environmental stewardship through picture books. The series was developed as a utility to teach children the importance of protecting habitats to sustain ecosystems, animal life and ultimately human life. Difficult environmental issues that impact animals and human interaction are brought into the story lines." The Green Spring is the original story about Maya and Victor and how the animals choose them to be their voice to help protect their habitat. - Ice Jams finds them in the Arctic, visiting their pen pal Iluak and sharing ways to protect the environment. - Jade Elephant explores India, where Maya and Victor save the elephants with their friend, Anju. - Gorilla's Roar heads to Rwanda, where their friend Inayah introduces Maya and Victor to the Gorillas. - Wolf Howls features Tiago, the younger brother of Victor and Maya. Who all go on a camping trip in the Rocky Mountains with their friend Kaya. Each story ends with a science section containing facts and stock photos about each animal featured in the story. Written by Sylvia M. Medina and Saige J. Ballock-Dixon. Illustrations by Joy Eagle. "Members of the Green Kids Club are working with animals to improve our world by using basic sustainability concepts of preservation, reduction, prevention and mitigation." Join the fun at: GreenKidsClub.com. We have so much to teach our kids, it is nice to find books that help tackle the big and important issues that our kids should learn at a young age, so its second nature to them. My 7 year old took to these books immediately and mentioned that they would be good for her Reading Counts Program at school. (An independent reading program offered at school) We will be donating the series to our local program so other children can enjoy and learn easy ways to help protect our environment. 7. Dispose of hazardous materials, like paint and cleaning products, properly. I would like to extend my gratitude to Green Kids Club for sponsoring this post. I'm always on the lookout for children’s books that reflect my values, so when the Green Kids Club contacted me to review their books, I jumped on it! They sent me the series for free, so I could review them and tell all of you about them. This series is designed to engage children in an interesting story with colorful pictures, and at the same time teach them about different environmental issues. They all feature a brother and sister who seem to be about middle-school aged, who go to different parts of the world talking to their friends, and through a bit of magic thrown in, talking to the animals. Our older two children are 10 and Timmy is 5, and the older two have each read one of the books to Timmy. I asked them what they thought about the series. The books are the right length to read one to a 5 year-old at bedtime. They said that they enjoyed reading the books, and that they liked that it teaches kids about different issues affecting our planet. Some of the ones I’ve read have talked about the melting ice caps, and how you can prevent it, deforestation in India and the problem with hunters freely hunting and trapping wolves in North America. I appreciate that they engage Timmy's attention and convey information at the same time. The series has a few books designed for younger kids where they took the same pictures and used fewer and simpler words. Unfortunately, the way they did this conversion makes those books somewhat disjointed and left me unsettled, because it seemed to be jumping all over the place. If the organization decides that they want to continue with books for younger children, I’d suggest that they write completely separate books or try to convey simpler ideas, rather than just putting fewer words on the same pages. Overall, I definitely recommend the series as a way to engage children to talk about different topics affecting our planet. They would work particularly well in a class room setting as an introduction to the issue in each book. Timmy and I look forward to reading the rest of the series.